The Roos Parish website seeks to provide useful information and news for residents of Roos, Tunstall, Hilston and Owstwick and others. Navigate through the various headings across the top of this page to discover more. will be held in the Memorial Institute on 8th April starting at 7.30pm. The Council has prepared a detailed response to the its main recommendations. Click here. The outcome of this Parish Council initiative has now been considered and several changes to its policies and procedures have been implemented. All aspects were also raised in the Parish Plan 2012. Growing discontentment with perceived lack of action"
Although there was only a 32%response, the return gives a reasonable 'snap shot' of opinion across the parish. It provides a basis for further consideration by the Council of issues raised by parish groups and associations. To view the full report click the links provided below. Summary Slide Presentation Full Report. Incidents of dog fouling continue to be reported at various locations throughout the village including Roos Playing Field. There is increasing concern about car parking at various points throughout the village. The ERYC Highways Department does not perceive this to be a problem as there is no history of incidents or accidents occurring. 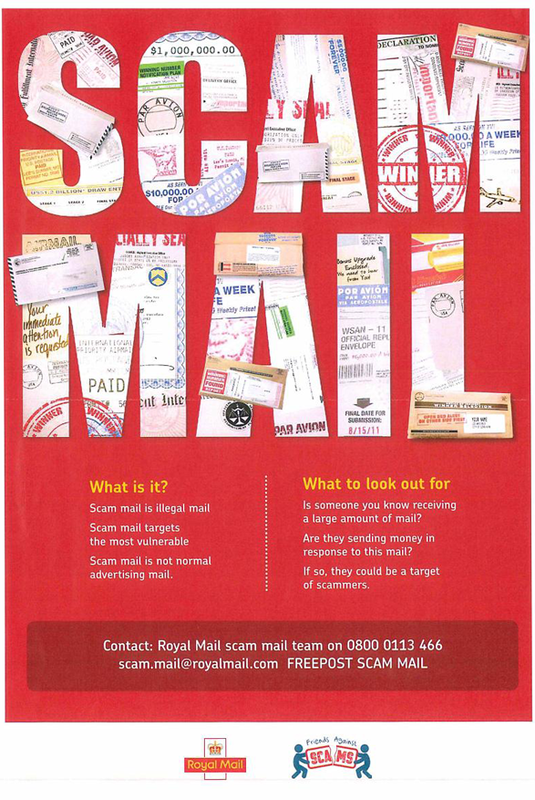 The Royal Mail has requesting the Parish Council to help raise the level of public awareness of the volume of Scam Mail being delivered to households. Since 2014 over 4 million suspect items have been intercepted before delivery and whilst the Royal Mail and postal workers take every precaution, some mail will still get through. The 2019 round of funding is now open, the closing date for receipt of applications is 31st March 2019. However applications costing less than £500 may be submitted to the Community Chest. The 2019 round of funding is now open, the closing date for receipt of applications is 31st March 2019 however applications costing less than £500 may be submitted to the Community Chest. Tree and Hedgerow Planting Opportunities. HEYwoods welcome applications from private and public landowners for new tree, woodland and hedgerow planting initiatives. The group is very proactive. It has recently produced batches of 'Roos Juice' pressed and bottled from fruit harvested during the Autumn. The harvest is from plantings of traditional species and unusual tree varieties. *This fund is administered by Grantscape - Milton Keynes. Applications are made on-line. The area of benefit is a coastal strip approximately 5 miles deep stretching from Flamborough to Kings Lynn. The outcomes of various consultation meetings have now been processed and schedules for potential development are announced. Some will benefit the parish. Note that ERYC consultation continues on alterations and possible reductions in Council funded transport services. The Hedon Shuttle - Bus Service CB 3 currently runs from Burton Pidsea and Roos to Hedon. Its schedule has recently been modified and now calls at Preston (Sandhills Garden Centre) and Bilton (Asda). If your property lies adjacent to Roos Beck, then Roos Parish Council recommends that you acquire a copy of "Living on the Edge" by either downloading from www.gov.uk or from the download panel. The booklet explains the rights and responsibilities of those living adjacent to a watercourse. The East Riding of Yorkshire Council is the overall risk management authority for Roos Beck. Call for applications. Sample form. The Rooster has been re-launched.